Shoelover wanted it to be known that the little situation involving US Senator Craig has not gone unnoticed and despite being contacted by 3 major international news outlets, 4 US senators, 3 US congressmen, 1 presidential candidate, 4 Canadian members of parliament and 2 provincial legislators from Ontario (not George Smitherman..........he's married damn it!!) about appropriate shoe usage in public washroom, Shoelover has refrained from making any judgment calls on the matter. Rather, Shoelover is capitalizing on the opportunity and is in the midst of printing stickers that fit over the toe box portion of a man's shoe that will read "I'm not soliciting you, I just ran out of toilet paper over here and wanted to see if you had some". A pack of 10 will be $5.99. 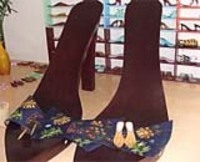 In a show of support for their communist comrades, the North Koreans, the Vietnamese have built a shoe in order to launch a surprise attack and crush George Bush while attending the APEC conference. 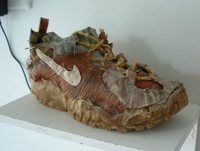 Did the guys from Gwar go out and start their own line of running shoes? THIS IS SHAWN MC FADDEN FROM USA I WILL LIKE TO PLACE AN ORDER IN YOUR STORES I WILL LIKE TO PLACE FOR 4 pieces OF FEMALE SHOES AND I WILL LIKE YOU TO CALCULATE THE TOTAL PRICE OF THE GOODS TO NIGERIA AND I WILL PAY WITH MY CREDIT CARD. 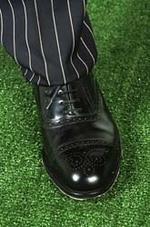 And yes, Shoelover still lusts after the IJC even though it looks like there could be some more competition!